A number of towns around the nation claim holding the first Memorial Day. The distinction generally goes to the town of Waterloo New York. Not so fast. On May 1, 1865, more than 10,000 people gathered for a parade, to hear speeches and dedicate the graves of Union dead in what is now Hampton Park in Charleston. The group consisted of several thousand black freedmen, northern missionaries and teachers who had arrived in Charleston to teach in freedmen schools post-War. 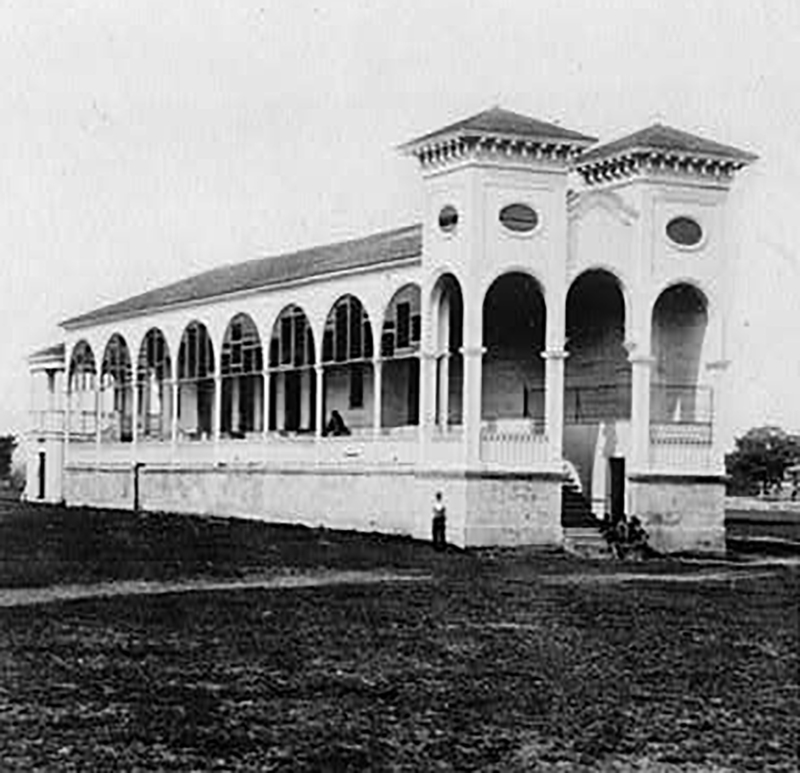 Club House of the Planters Race Course where Union soldiers were imprisoned. Hampton Park was originally the Planters Race Course and, during the final months of the Civil War, it was a hellish open-air Confederate prison. A total of 257 Union troops died at the camp, some of whom had been transferred from the infamously horrific Andersonville in Georgia before it was liberated. The symbolic power of the low-country planter aristocracy’s horse track (where they had displayed their wealth, leisure, and influence) was not lost on the freed people. The procession began at 9:00 a.m., led by 3000 black children carrying roses and singing “John Brown’s Body.” They were followed by several hundred black women with baskets of flowers and crosses. Black men marched in cadence next, followed Union soldiers which included the famous 54th Massachusetts (made famous in the movie Glory) and the 34th and 104th U.S. Colored Troops. Inside the cemetery a children’s choir sang several spirituals, “We’ll Rally Around the Flag” and “The Star Spangled Banner.” Several black ministers read from Bible scriptures. After the service, the crowd gathered for a picnic, watched the soldiers drill and listened to speeches. Burial site of soldiers on the race course. This was the first Memorial Day. African Americans invented Memorial Day in Charleston, South Carolina. What you have there is black Americans recently freed from slavery announcing to the world with their flowers, their feet, and their songs what the war had been about. What they basically were creating was the Independence Day of a Second American Revolution. In 1876 former confederate general Wade Hampton declared that it was time for white Southerners to “dedicate themselves to the redemption of the South.” Hampton was elected South Carolina governor that year in one of the most volatile elections in the state’s history, filled with riots, murders, intimidations and blatant voter fraud. Hampton, running on his white-supremacy program, narrowly defeated Republican governor Daniel Chamberlain, despite the presence of Federal troops under General William T. Sherman in an attempt to stop violent mob action at the polls. On election night, the voter count in Laurens and Edgefield counties exceeded the total population – with most of the votes going to Hampton and the Democrats. For the next four months South Carolina had rival houses and governors, each claiming to be the legitimate government. White citizens refused to pay their taxes to the Republican administration, but voluntarily contributed 10 percent of their money to the Democrat government. If a state agency wanted money to operate, they had to ask Hampton for funds. Soon there were defections from the Republican administration and Chamberlain’s power base faltered. When Rutherford B. Hayes was inaugurated as the President of the United States both governors appeared before him. 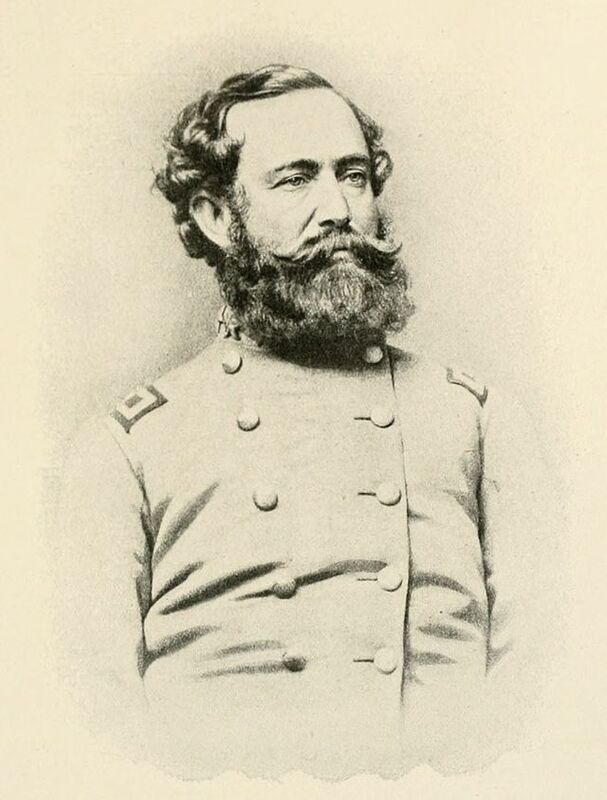 Hayes announced that “the whole army of United States would be inadequate to enforce the authority of Governor Chamberlain.” He ordered the evacuation of the Federal troops from South Carolina and in the first week of April 1877, Chamberlain and the Republicans vacated their offices. Despite the chaos, the election accomplished Hampton’s goal; it wrenched control from post-War Republicans, many from the North, and back into the hands of the white Democrats. They began to institute a series of laws and reforms which removed tens of thousands of blacks from voter’s rolls. They also established a Confederate Memorial Day designed to help smother the memory of the annual Decoration Day for fallen Union soldiers. As the Lost Cause tradition set in — the Confederate version of the meaning and memory of the war — no one in white Charleston or the state was interested in remembering the war through this event. 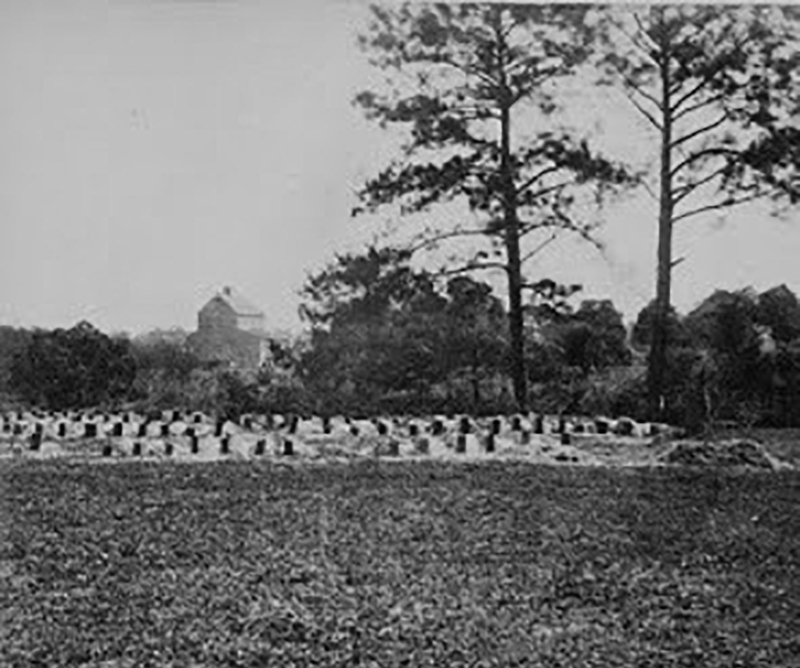 By this time the race course cemetery was suffering from neglect, and the soldiers were reinterred at the Beaufort and Florence National Cemeteries. 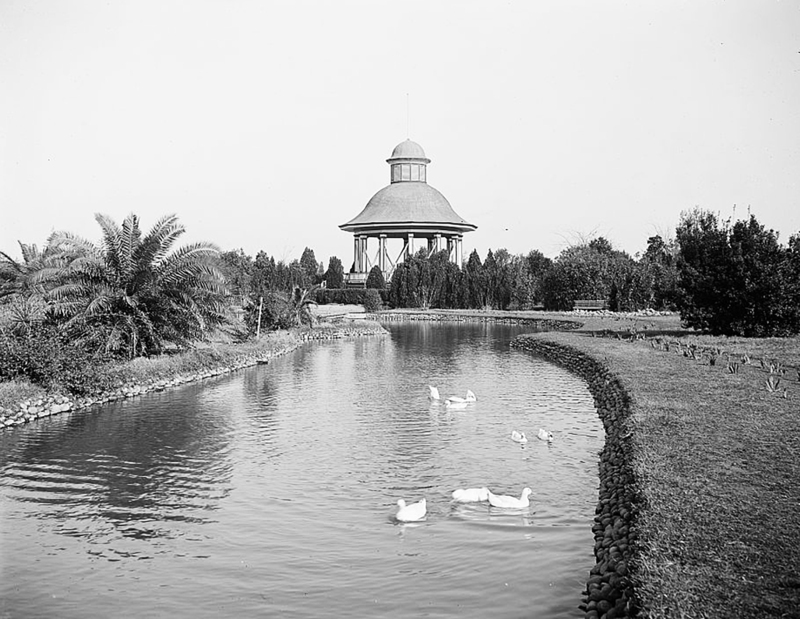 In 1902 the site of the race course and former cemetery became part of the fair grounds for the South Carolina Inter-State and West Indian Exposition. At the conclusion of the Expo, the city of Charleston acquired the land for a park, which they ironically named in honor of General (and governor) Wade Hampton. Through the years Memorial Day was generally celebrated May 30. Beginning in 1971, the federal holiday was designated as the last Monday in May. Marker honoring the first Memorial Day and Union cemetery. 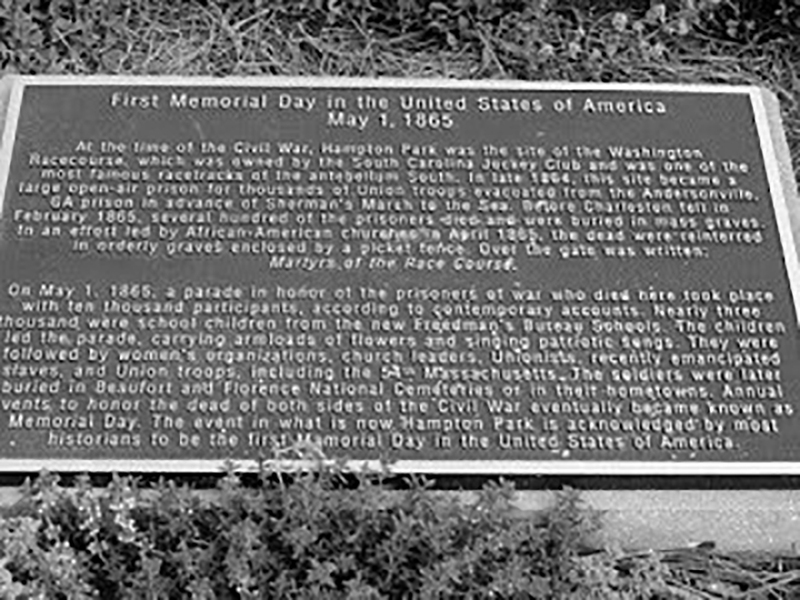 This entry was posted in Charleston Firsts, Today In Charleston History, Today In History and tagged Memorial Day. Bookmark the permalink.